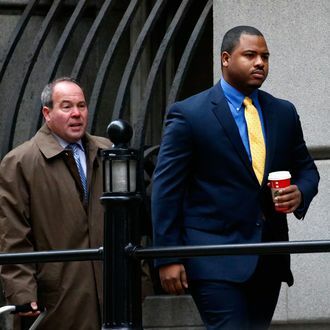 William Porter, one of the six Baltimore cops charged in relation to Freddie Gray’s death, is going to have to testify at his fellow officers’ hearings, said Maryland’s Court of Appeals on Tuesday. Porter, whose own trial in December ended in a hung jury, will most likely be retried this summer. Until today’s ruling, Porter’s attorneys had been trying to avoid having him take the stand during his colleagues’ trials, saying that he risks incriminating himself. “Every time he gets up on the stand, he subjects himself to a perjury charge, which carries 10 years more,” said Gary Proctor, Porter’s lawyer. “On top of that, look around. It will be live-tweeted. What Officer Porter said will be covered in the news. The jurors will hear it. The witnesses will hear it.” Prosecutors said that Porter will be granted limited immunity, such that nothing he says on the stand will be used against him in the later trial. Porter was the first officer to defend himself in connection with the death of Gray, the 25-year-old who died from a neck injury after he was given a “rough ride” in a van last April. Porter had testified that it was the driver’s role to make sure that Gray was wearing a seat belt and that he, personally, bore no responsibility. (That driver, Officer Caesar Goodson, is charged with second-degree murder.) Given this rejected appeal, the five cases in which he will testify are being sent back to the lower court, where hearings will continue.